How long should a trailer tongue be? Is there a standard or is it totally arbitrary? Let’s get some answers on this fun trailer tongue length topic. Except, I need to ask: How much do you want to know about it? The stimulation for this post comes from a reader question. I’ve edited the question for flow. As a thought experiment, let’s imagine an 8′ utility trailer with 4′ tongue. The axle is positioned so with an even load on the trailer bed, the resulting tongue load is 15%. (As described in the article “Where Does The Axle Go?“) Now, if we extend the tongue to 12′, the trailer would look ridiculous, but the tongue load would go down to 7.5% — half. The center of mass with respect to the axle is the same, so would the second case also tow stable? (Despite being outside the normal rule of thumb?) Are there other inherent stability benefits of trailer tongue length? Before we give an answer, what are your predictions? My guess is most of you know the answer by gut feel, but might not know how to explain it. Let’s see. What’s With The Tongue Load And Stability Anyway? To best explain the effect of trailer tongue length, let’s take the above experiment and play with it a bit. Let’s take the 8′ trailer with the 4′ tongue described above and move the load in the trailer back so there is Zero load on the tongue. Perfectly balanced on the axle. Now, let’s have you drive down the road. When your car goes over a bump it pushes the tongue up fast, which throws the load back slightly, which really makes the trailer want to flip back (because the load is now behind the axle and there is inertia with the load pivoting around the axle). Of course the trailer does not flip back, because you tightened the hitch properly. Good Job! Next, as your car comes down from the bump, the process goes the other way. The tongue pulls down and the load rotates back to where the tongue has Zero load. Then the trailer goes over a bump. The dynamic load switching causes some weird dynamics for the driver that feels like it is “bucking”. The same, but opposite, is true for a car going into a hole in the road. On the other hand, if the trailer has the load forward of the axle, the tongue load is always positive, even when there are dynamics at the car moving the tongue up and down. Experimentally, a tongue load of 10% to 15% of the total trailer (with cargo) works well for dynamics. Will The Long Tongue Trailer Also Tow Stable? Making the trailer tongue length 12′ (as mentioned in the reader question above) does indeed decrease the tongue load (to 7.5%). How does that affect things? Let’s think about what will happen when we hook that up to your car and drive over that bump. Again, think about the trailer setup with perfect balance over the axle, and the tongue has Zero load. As the car goes up over the bump, the end of the long tongue goes up with it. However, because the tongue is so long, the trailer itself does not tilt as much, so there is less “bucking” — even though the trailer has the improper loading. Also, the tongue works as a long lever to move the load up and down, which works to further reduce the effect of buckling. With the trailer properly loaded (tongue load around 12%), a longer tongue acts like a damper to the other dynamics at the trailer. For an obnoxiously long 12′ tongue, from the trailer’s perspective, it makes the bump feel half as high. That’s part of why we tell people to avoid trailers with really short tongues. Please, don’t take this example as more than an illustration. A 4′ tongue is long for an 8′ trailer, and a 12′ tongue is ridiculous. Also, Please note that the above discussion is straight line, 2-dimensional dynamics. There’s much more to it. Trailer tongue length is not the only effect in play. 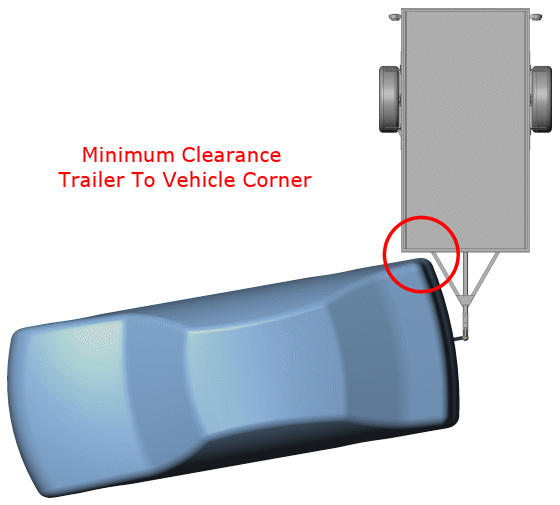 There are some confounding effects like the tow vehicle rear overhang, and the overall trailer length. A longer overall trailer length looks in many respects like extra trailer tongue length. Think about it as the distance from hitch to trailer wheels — though that’s not totally true because of the distribution of load over a longer trailer. In the Article about Trailer Strength (on the Synthesis website), we talk just briefly about trailer tongue length. A longer-ish tongue — within reason — has nifty advantages. Turning Radius is compromised with a really short tongue. The tongue should be long enough for a good turning radius, and to allow clearance when backing. Short tongues impede back up ability, turning radius and jack-knife susceptibility. Backing a long trailer is much easier than a short one, and part of that is trailer tongue length. A longer tongue is nice for extending axle separation (distance from the tow vehicle rear axle to the trailer front axle) for both stability and bounce. Finally, the loading distribution on the trailer is less sensitive with a longer tongue. This is a minor effect, and you must always be conscience of the way a trailer is loaded, but having a little less tongue weight with a long tongue is easier to manage. 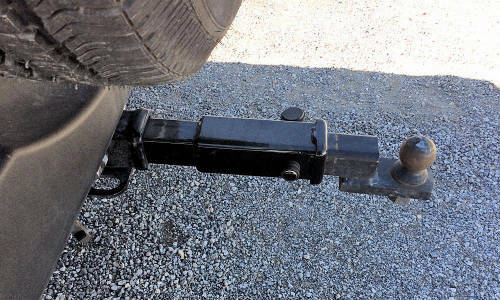 Basically, the shorter the tongue, the higher the percentage of trailer weight should be on the hitch. Within the guidelines, of course. Some added Advantages of a long tongue include: 1) Backing advantages of a longer trailer. 2) A longer tongue makes it easier to access the rear of the towing vehicle. Easier to get cargo or people in and out. Now for the Disadvantages. One important disadvantage of a long tongue is Aerodynamics. The more space there is between the tow vehicle and the trailer, the more turbulence there is, and the more aerodynamic loss. That means fuel mileage goes down with a longer tongue. Truly this is a small effect for a small trailer, but a larger trailer (with more frontal area), over a long distance, will make a difference. Turning radius also changes with a long tongue. When turning a corner, the trailer always takes a shorter path than the tow vehicle. The longer the trailer, and the tighter the turn, the more of this effect. A long tongue means you’ll need to be more aware of hitting curbs as you go around corners. However, on the practical side, for small changes in tongue length (like 6″) you won’t notice a difference. Ride level is maintained better with a long tongue because the hitch height has less of an effect on the ride level. Finally, storage is a disadvantages of a longer tongue. The tongue takes space and increases the total length of the trailer, so it takes more space to store. Unless, you do something crazy like make the tongue fold (or shorten with a hinge like this) so the storage space required is drastically reduced. How Long Should The Tongue Be? So far we’ve danced all around the issues of trailer tongue length. We’ve talked about towing stability, turning radius, backing up, and more. Yet, we have not answered the main question. Let’s start by looking at a minimum. The tongue should be long enough that the trailer clears the tow vehicle in tightest turns. Usually that means backing situations. See the image. That’s the minimum. The maximum is up to you. There is a diminishing return to increasing tongue length, so find your optimum based on the size of the trailer and your balance with the disadvantages. Many designers make tongues at 30″ to 36″. I personally think that’s too short. When the tongue gets to the 40″ to 46″ length, that seems to be the sweet spot. The blue frame flatbed trailer pictured at the top of this article has a tongue length of 72″. That is really nice for stability and backing, but it does make the trailer unreasonably long in some circumstances. That trailer was built with a few experiments in mind, so some of the things on it are not really standard — like the long tongue, the walking beam suspension and the folding tongue. Make the tongue longer than the minimum for your vehicle, plus whatever added length you feel fits your situation. Longer is better for stability, but a pain when it comes to stepping around it and storing it. Good luck with your projects!